I could rave about how this fellows curves follow the rock. In fact I am raving about it. Also check out the serpent hear on this guy and his buzzy tail. Rattlesnake for sure. Bad snakes have been giving good snakes a bum rap for eons. It all started when the Biblical Eve bit into the apple she had obtained from the proverbial snake in the tree and realized she was naked. It must have been a shocking discovery. Snakes have been pummeled, stomped, cut up, diced, crushed, shot, speared and smashed ever since. Actually, there is no such thing as a bad snake; there are only snakes that have had a bad childhood and will bite you if you step on them or wake them up when they are sunbathing on their favorite rock or lollygagging in a scummy pond. They don’t really mean to kill you; it’s a waste of good venom. Normally, we are too big to eat. I’ve had numerous snake encounters over the years from the rainforests of the Amazon and West Africa to the rattlesnake country of the American West. Believe me when I say there is nothing like stepping on a log and having it come alive with the buzz of rattlesnakes. I once set an Olympic record for the standing long jump when that happened. Another time, I almost sat on a rattler when I was going to the bathroom in the woods. I couldn’t poop for days. 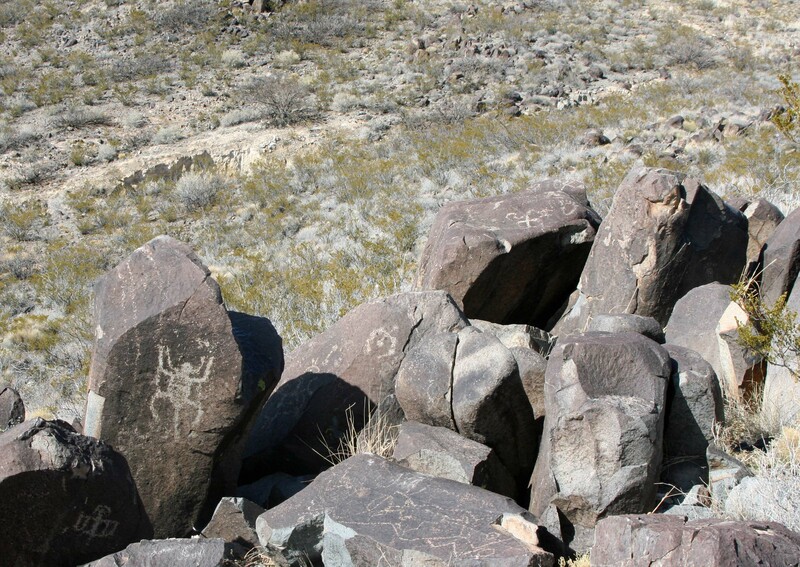 The Jornada Mogollon people of the Three Rivers Petroglyph site must have had a special relationship with snakes. 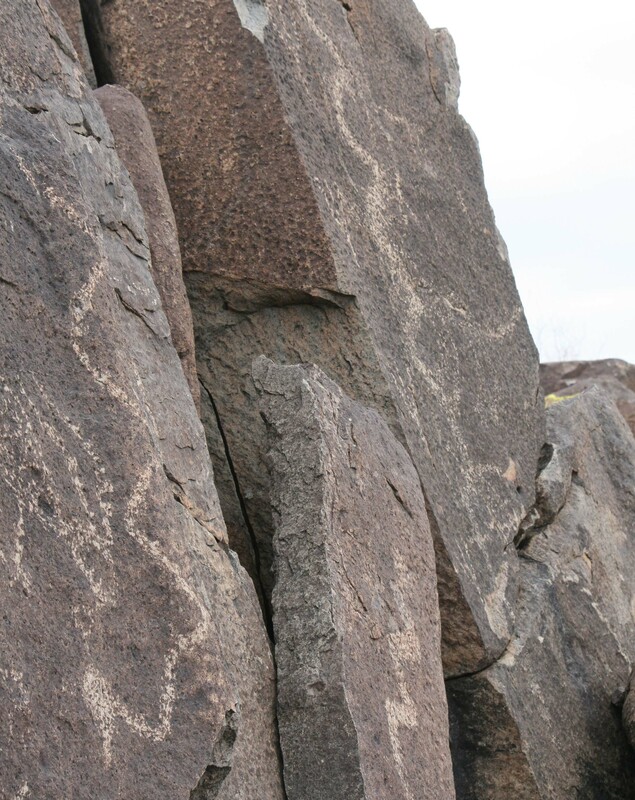 There are numerous snake glyphs scattered throughout the area… and these are BIG snakes with BIG heads and jaws. 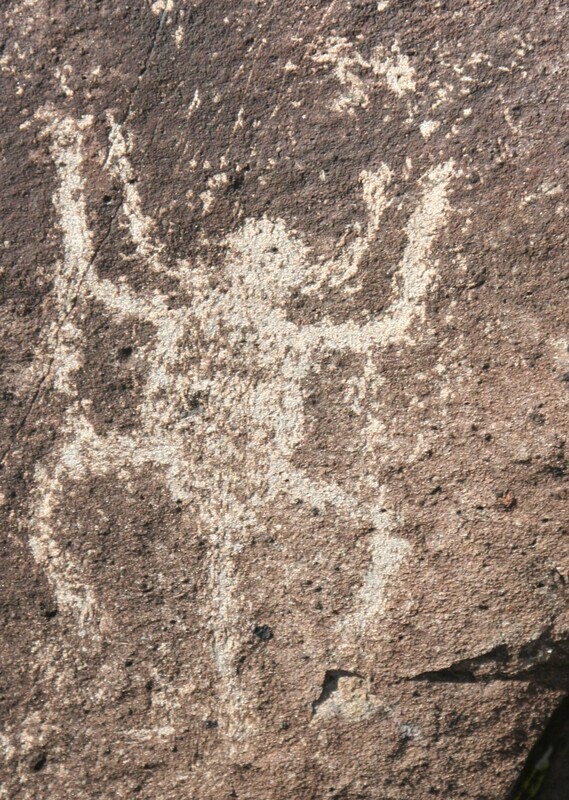 “The better to bite you with my dear.” I suspect the snakes were considered sacred and worshipped, which is what the nearby Navajo and Hopi people did. These long snakes slithering down the rocks are worthy of an Indiana Jones movie. In the world of big snake heads, this Three Rivers serpent would be a record holder. 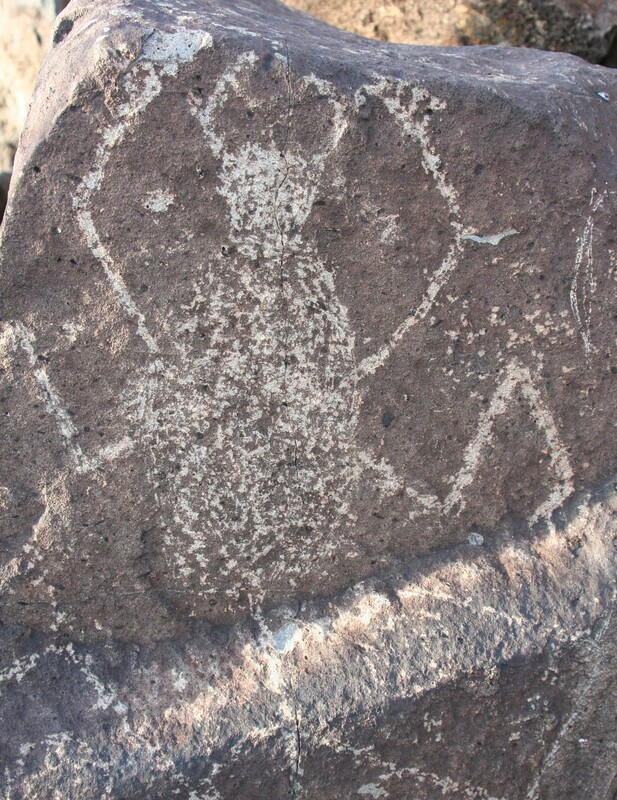 Rattlesnakes weren’t the only poisonous denizens of the desert recorded in the petroglyphs of Three Rivers. There were also spiders and scorpions. 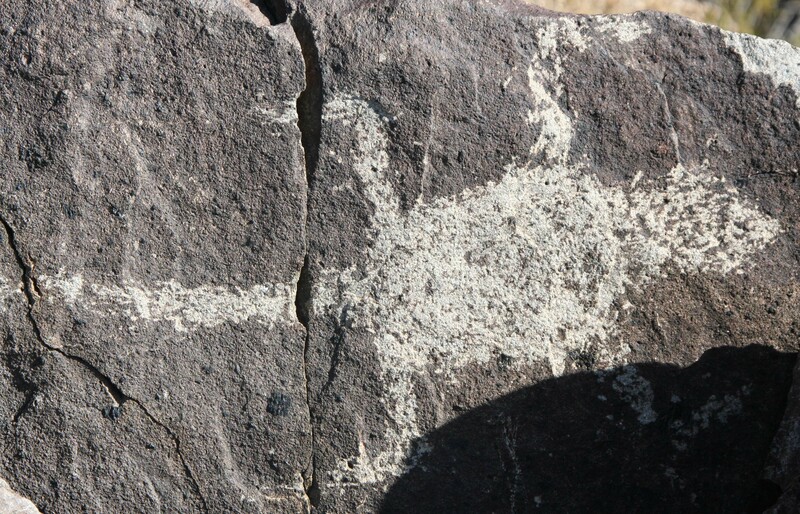 On the more benign side of the equation, there were numerous rock art lizards. I think this large, scary bug is probably a spider. My money would be on a scorpion here. Check out the rounded end of his tail and the two pincher claws up front. This is where we found the scorpion. I suspect that his modern-day cousins are lurking in the rocks surrounding him. 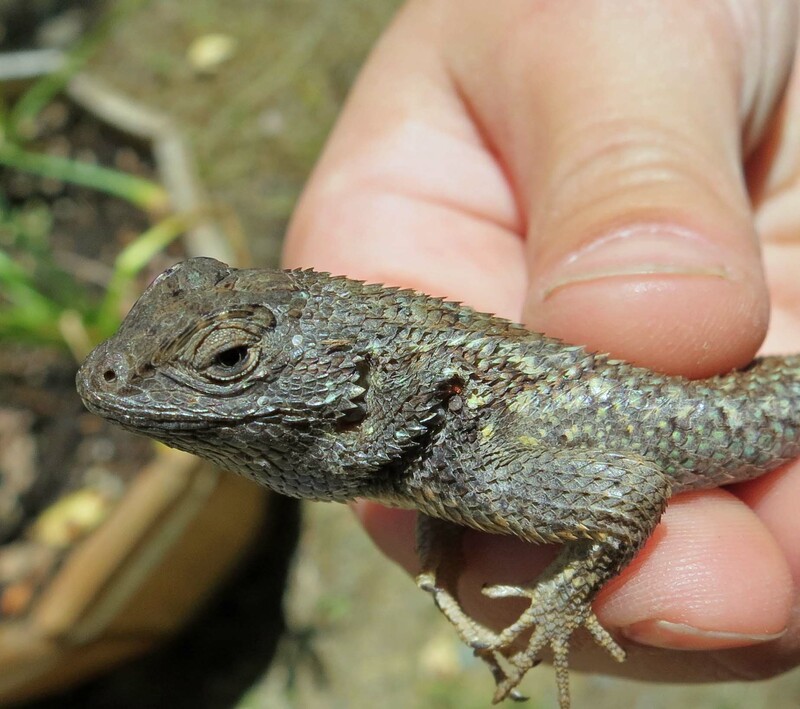 Lizards are considered much more benign than snakes, spiders and scorpions. For example, my eight year old grandson Ethan caught several during his recent visit. He was only chomped on a couple of times. This frog doesn’t belong here along with the reptiles and bugs but he absolutely had to go somewhere. 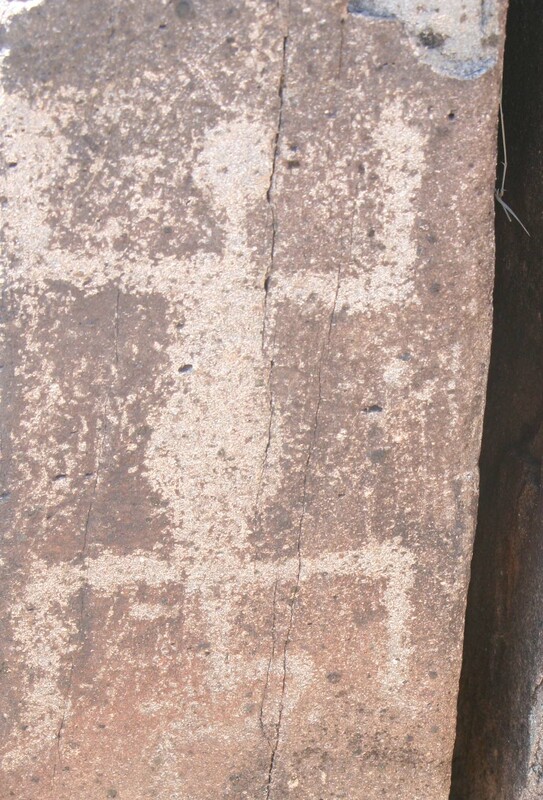 NEXT BLOG: Patterns in the rock. 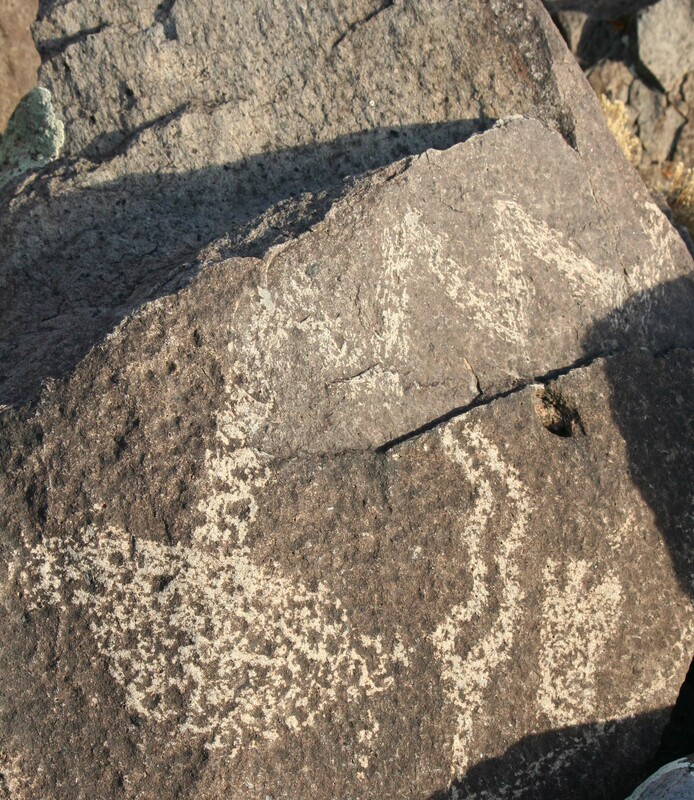 We will look at some of the many geometric patterns found among the petroglyphs and guess at their meaning. Ethan loved having his lizard featured-he loved it! The spider and scorpion were immediately recognizable – not much question about them. Annie Dillard once said, “The lover can see, and the knowledgeable”. Whether the folks who created those glyphs loved the spider and scorpion is debatable, but there’s no question they knew them. The frog in the last photo looks exactly like my 10th grade biology frog. I skinned it, dried the skin, flattened it, and then took it home. I tucked it between the bedspread and my mother’s pillow. 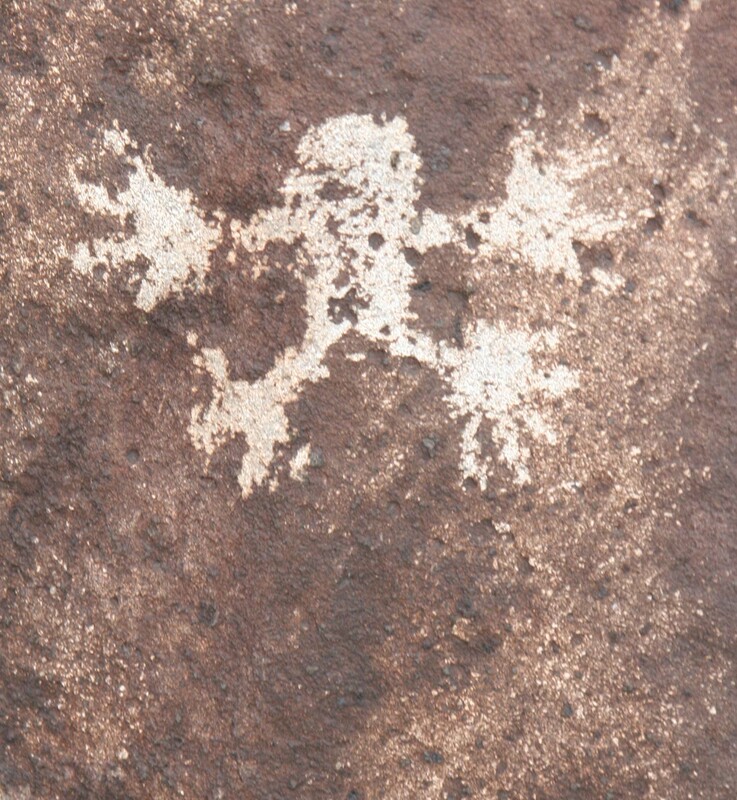 Come to think of it, the glyph not only looks like the frog, it looks a bit like my mother before we peeled her off the ceiling. Thought I had replied but it isn’t showing up. I am working between to laptops… an old one on the edge and a new one without all of the bugs worked out. Liberians and snakes were always amusing. Even our cat Rasputin could clear five feet if I rolled the spring from our screen door at hime. 🙂 As for frogs, I can see you peeling your mom off of the ceiling. You did reply, and it did show up, but I just checked and it’s gone from my archive, too. Who knows? Maybe spider, scorpion and snake are tricksters! Oh – I’m seeing it here on your blog page. Who knows? LOVE the Kristen pink cactus. I’ve never seen one like that boerfe. Your Christmas cactus plants look very healthy. Sadly, mine are neglected. I need to repot my Thanksgiving cactus. That has been on the list for about 10 years now. I also really like that you have a new camera strap of repurposed fabric. That’s green living in action.